I just received the latest Cookinglight magazine today and this is the first recipe I make! 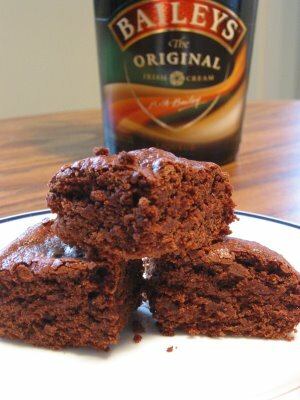 Irish Cream Brownie is a combination of 2 of my favorite things together: Irish Cream + Chocolate. Do I have to say more? I know I have to make it, eventhough I was really tired,and I have already made some goodies for OCT's Friday lab meeting. One thing I like about making brownie is its simplicity. You don't have to take the butter out in advance, and mixer is absolutely not required. Compare this to the Nancy Baggett's Fudge Brownies Supreme I made sometime ago, this has a pronouned Irish Cream flavor, more to adult liking come to think of it. I believe children or people who do not like alcohol would prefer Nancy Baggett's version (eg OCT). I slightly overbaked the brownie. Not on intention, but it was already fully baked at 15 minutes. According to the recipe, it should be done around 20 minutes. Maybe I will shorten the baking time to 12 to 13 minutes, if I ever baked this again. I doubt....not that it's not nice. But they are so many other tempting recipes out there! I have just bought 10 blocks of cream cheese which was on sale, so I guess I will tackle some cheesecake recipes soon. That will be after I get back from our " Happiest Celebration on Earth" vacation of course. These look amazing. I will have to give them a try. I made these brownies, and I (as well as everyone else who ate them) was in awe. Thank you for sharing this recipe--it's definitely one 'll hang onto. You have just given me a fantastic idea of how to use up my half bottle of bailey which has been sitting around waiting for a good recipe like this to come by. The recipe calls for 1/2 cup of egg substitute, how many eggs would that be if i don't use substitute. You can use 2 eggs insteads of 1/2 cup egg substitute.